MidAmerica Basement Systems has the products and expertise you need for a beautiful, healthy finished basement space. If your home is in need of a little extra space, finishing your basement is an extremely cost-effective way to add value and comfort - when the job is done correctly. Because the basement is a moist, damp space, you need to work with a contractor with the knowledge and skills to install basement-friendly products that will last a lifetime. MidAmerica Basement Systems is a part of the Total Basement Finishing™ dealer network, dedicated to providing top-quality solutions to transform your old, unsightly basement into the finished space you need. As a part of this network, we have access to proven, patented basement products that have been used in thousands of homes across the country. Talk to our design experts about your ideas for basement finishing or remodeling by scheduling a free estimate! 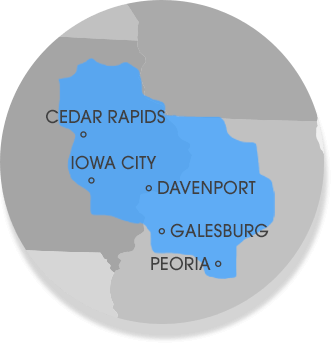 We serve homeowners in Cedar Rapids, Peoria, Waterloo, Davenport and throughout the surrounding areas. The Total Basement Finishing™ System is designed to get you through the entire remodeling process, from start to finish. Made up of basement walls, flooring, ceiling, and other products designed for the basement space, you'll end up with a stylish, clean room that will add value to your home. On top of the essentials like walls and flooring, our system also offers finishing touches like crown molding, column wraps, doors, staircases, and much more. We can also assist with electrical wiring and anything else you need to make your basement ready to use! The best part about finishing a basement is that it can become any room you desire. Whether you're looking to create an extra bedroom or playroom, build a bar or den, or even use the space for additional storage, MidAmerica Basement Systems is here to help! Haven't decided what you're going to put into your new finished space? Browse our design ideas and see what other homeowners have done in the past for inspiration! We'll discuss your project with you down to the last detail, so you can achieve the results you're after. When you call MidAmerica Basement Systems, we'll set up an on-site inspection of your basement and a design consultation to plan your project. Using Total Basement Vision, our interactive software program, you'll be able to visualize the finished space before we get started. Once you're ready to go ahead with the project, we'll immediately provide you with a written cost estimate. We don't want there to be any surprises down the road, and our top priority is your comfort and satisfaction with your basement finishing project! Ready to get started with basement finishing or remodeling? Call us at 1-844-218-0509 or contact us online to schedule a free estimate today! We serve homeowners in Peoria, Cedar Rapids, Davenport, Waterloo, Iowa City, Normal, Rock Island, Dubuque, Moline, East Peoria, Clinton, and throughout the surrounding areas.